There’s a great deal of pleasure for me in seeing the familiar unfamiliar. In a world that is profoundly over-saturated in imagery, stimulus and sensation (whether artistic, personal or commercial), finding myself experiencing something I have already experienced and actually experiencing it fresh is immensely exciting. I don’t know that it exactly changes my world, but for example, a cover of Smells Like Teen Spirit always rattles my chain, because the song is equal parts totally meaningless to me and one of the most expedient ways to remind me of what I felt like as a young adolescent – and that to share that experience, you really had to be there. 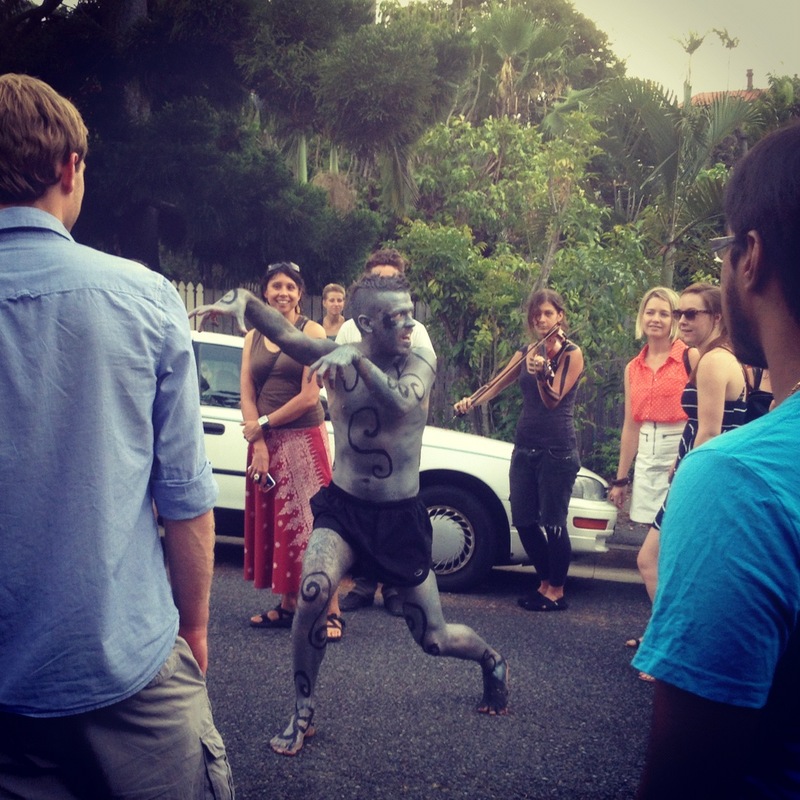 Although not a perfect analogue, I felt very similar watching Scott Sneddon/Darkwing Dubs performing his new physical theatre/poetry piece at the recent Laura St Festival. I have felt inspired, heartened and challenged by much of what I experienced at Laura St – a free, community-based festival that is held in people’s homes in a suburban street – an idea so simple and so lovely it’s almost re-revolutionary in the context of the contemporary nanny state. I’ve written some rather oblique responses to the festival, and the life within it, and might write more if I work out where my head’s at. But Scott’s new work, Shooting at Shadows – a roughly 15 minute physical theatre poetic dialogue between the gorgeous narrator, Lucy Fox; a lost shadow, Scott Sneddon; and the violin accompaniment of Fern Thompsett – sits in a different place, even though it was launched at the same festival. I hope to see it restaged again. I know Scott, and love him well, have performed with/beside/nearby him in several different contexts and although you can certainly take my advice on the subject, a quick trawl of the internet will let you know that Darkwing Dubs is a dynamic, physically committed spoken word performer capable of great energy and genuine entertainment. And as a person who can be sometimes resolutely bleak and down on everything jolly, it’s important that work like Scott’s come and tickle me under the armpit from time to time. The work starts at the bottom of the street, where a few lolling locals and one or two tourists are inadvertently waiting at the appointed moment. By the time it ends, however, there’s a crowd of anywhere from 40-60 people, many of whom have redirected their foot-traffic to join with the throng who are following Scott, Fern and Lucy up the hill while pondering just what happens to a shadow that has become detached from its solid. Scott is painted silver and black, and dressed in nothing but a small part of shorts. I keep hoping he won’t hug me, and wish I hadn’t believed that thing about the Goldfinger woman when I was a child. Luckily, there’s no hugging in the show, and you don’t breathe out your skin anyway, I’m just the embodiment of the nanny state. The language feels deliberately simple, evoking childhood and fantasy and the many great quests and journeys of our earliest heroes and heroines, the stories of childhood, that place of ultimate journey where all one desires is to move from the unknown, unsure, afraid and young to the known, certain, unafraid and adult – to grow up. At surface value, or perhaps if you just stepped in at number 32 and stayed all the way up to number 20 – you could leave it there. Scott is the “shadow of god” and springing elf-like up the hill at a hippy festival is exactly where we’d expect to see a full-body painted man proclaiming that. But I didn’t see that, and I guess that being a chronic over thinker, I can at least be grateful for the fact that I’ve always got something to pick at intellectually. Nothing ever just “happens” and with time enough I can find an abundance of meaning in the smallest of things, pick pick pick meaning meaning wonder pick pick pick wonder. I wish I had another hobby sometimes. I just want to be a part. I often wonder if spoken word poetry is not in fact an art form, or that – more specifically – waiting for your turn to speak is not an art form, it’s just common social courtesy. And if we’re going to be subjecting each other to unpaid therapy sessions, then at the very least we should listen patiently and wait until it’s our turn. So it is a pleasure to see Scott performing something different – both for him and the crowd; bearing witness to the burgeoning thrill of the new audience physically and emotionally connecting with language play; and the bravery of a performer challenging the known bounds of their style. The gentle guiding voice of Lucy’s narration and the alternating scratchings and soothings of Fern’s violin score were perfect accompaniments to this new experiment. As an endless overthinker, I would also be interested to see how the work played completely stripped of the performance element – perhaps more like a live “talking book”. Just Scott, Lucy and Fern, stood side by side on a plain, lightly lit stage, with the dark of a quiet evening, perhaps one of those rare ones like last night where it gently rains here in Queensland and everything feels like it could be reborn. I often used to ask lovers to read to me aloud in bed before sleep – I often asked if they would let me do the same. No one has really been as into it as me, but I hold out hopes for someone who might remember that pleasure from childhood, the pleasure of being read a story, your head laid on someone’s chest, someone whose heartbeat felt steady and reassuring, whose warmth you considered permanent, all of which provided the platform upon which you were finally solid enough to leave that which was concrete and known, and play in the imaginary of story. Maybe I could ask him if he would do a cover. He is arguably the most innovative and exciting young spoken word performer in the country today. You never know where he’s going to take you and you don’t care.